The practice of meditation, according to Zen master Thich Nhat Hanh, is like the power of the sun, illuminating the areas of our life that dwell in darkness. Instead of suppressing anger, fear, and guilt, Hanh suggests that we should be mindful of these emotions, which will allow our natural patience and appreciation for life to unfold. 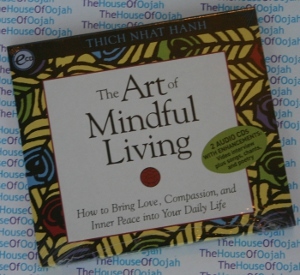 Recorded during an intimate family retreat, The Art of Mindful Living presents Thich Nhat Hanh's practical, traditional gathas (teachings) that join ancient meditation practice with the challenges of the modern world. It includes step-by-step guides to meditation, breathing exercises, contemplation, and communication, opening our hearts and minds to the joyous wonder of tranquility and love. Thich Nhat Hanh was born Nguyễn Xuân Bảo in Thừa Thiên (Central Vietnam) in 1926. At the age of 16 he entered the monastery at Từ Hiếu Temple near Huế, Vietnam, where his primary teacher was Dhyana (meditation; Zen) Master Thanh Quý Chân Thật. A graduate of Bao Quoc Buddhist Academy in Central Vietnam, Thich Nhat Hanh received training in Zen (in Vietnamese: Thiền) and the Mahayana school of Buddhism and was ordained as a monk in 1949. Thich Nhat Hanh is now recognized as a Dharmacharya and as the spiritual head of the Từ Hiếu Temple and associated monasteries. He is the Elder of the Từ Hiếu branch of the 8th generation of the Liễu Quán lineage in the 42nd generation of the Lâm Tế Dhyana school (Lin Chi Chan in Chinese or Rinzai Zen in Japanese). On May 1st, 1966 at Từ Hiếu Temple, Thich Nhat Hanh received the “lamp transmission”, making him a Dharmacharya or Dharma Teacher, from Master Chân Thật. Thich Nhat Hanh has combined his deep knowledge of a variety of traditional Zen teaching methods with methods from Theravada Buddhism and ideas from Western psychology to form his approach to modern Zen practice. Thich Nhat Hanh has become an important influence in the development of Western Buddhism. In 1956 he was named Editor-in-Chief of Vietnamese Buddhism, the periodical of the Unified Vietnam Buddhist Association (Giáo Hội Phật Giáo Việt Nam Thống Nhất). In the following years he founded Lá Bối Press, the Van Hanh Buddhist University in Saigon, and the School of Youth for Social Service (SYSS), a corps of Buddhist peace workers who went into rural areas to establish schools, build health care clinics, and help re-build villages.